Curries are a regular feature here on my website and Indian Curries in particular. I love them all from the mild chicken pasanda through to fiery lamb madras. I’m equally delighted with the less meaty offerings like saag aloo or aloo gobi. This particular recipe falls on those vegetarian/vegan leanings that Indian food does so well. It is hot and sour, with the sour element provided by tamarind pulp. But it is also fragrant calling on freshly ground spices to really turn the flavour up to 11! Are Freshly Ground Spices Really Better? But like many things in life, a simple yes or no answer is a little too simple. 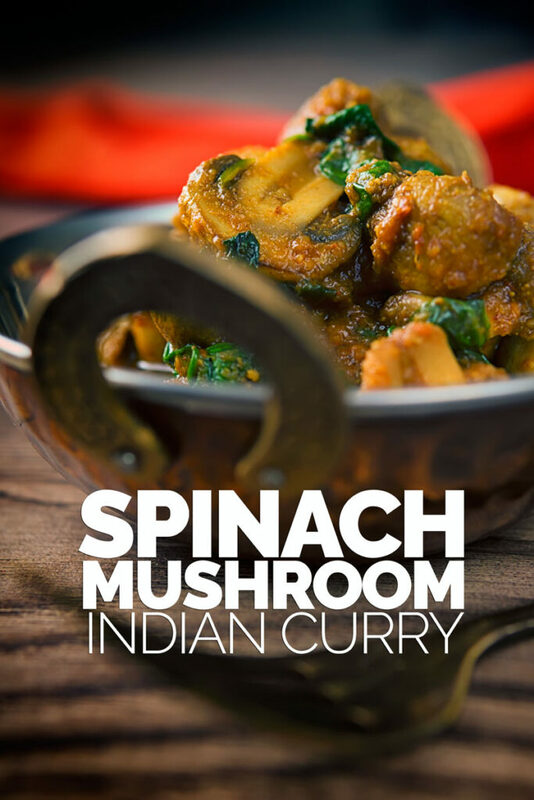 As you can see from this spinach and mushroom curry I use both ground and seed spices. In general seeds have a longer shelf life than ground seeds, when ground spices will lose both flavour and aroma at different rates. To see this in action just take a sniff of ground pepper and compare it to a peppercorn you have just crushed. It will be like night and day! As a result, wherever possible I try and buy and use spices that come in seed form. Things like cumin, fennel, coriander, fenugreek and cloves are all amazing. Toasting these spices helps to release that aroma which always gives a boost in flavour. I then grind in a cheap coffee grinder. Spices like turmeric and chili powder are perfectly fine ground. Just make sure that you do not leave them hanging around too long. Buy a packet that you will use within a few weeks and always store in an airtight container. 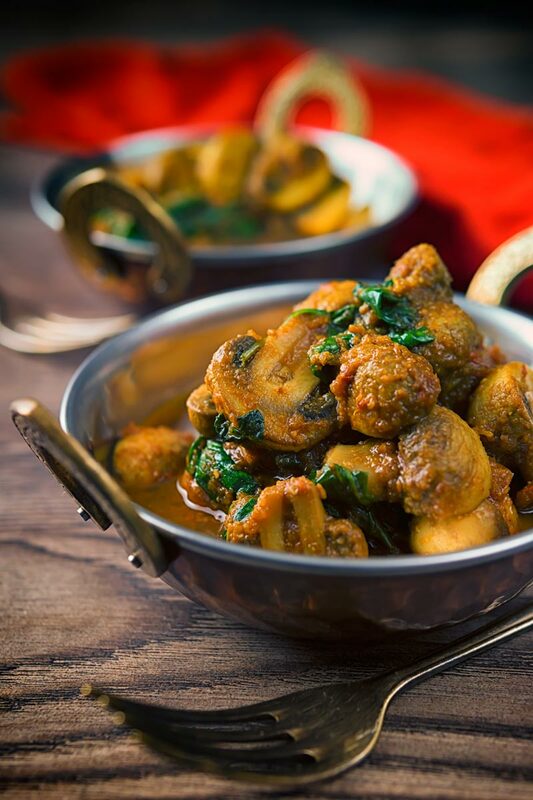 There are a couple of areas to consider when cooking this mushroom curry. The first thing that you want is some ripe red tomatoes. If all you can get is firm under-ripe watery tomatoes that are common in supermarkets out of season then do not use them. 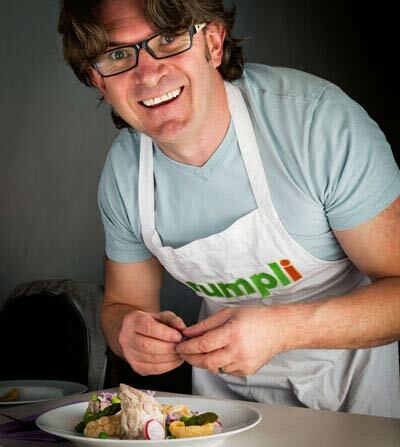 Open a can of tomatoes which are infinitely better than some supermarket tomatoes and use them instead. Just substitute in the same weight! The second hint relates to the amount of water you add. I list 100ml in the recipe, however, you will need to vary this and use the amount that gets you the sauce consistency you like. Both the mushroom and tomatoes will contribute a differing amount of liquid to the gravy and because of this you will need to use your own judgement. Other than that, enjoy yourself this it is a super tasty recipe and it really is as simple as it looks! 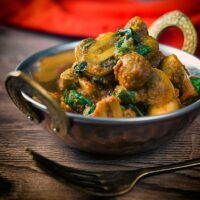 This spinach and mushroom curry is a simple dish that is bursting with lots of flavour and a lovely punch of chili. 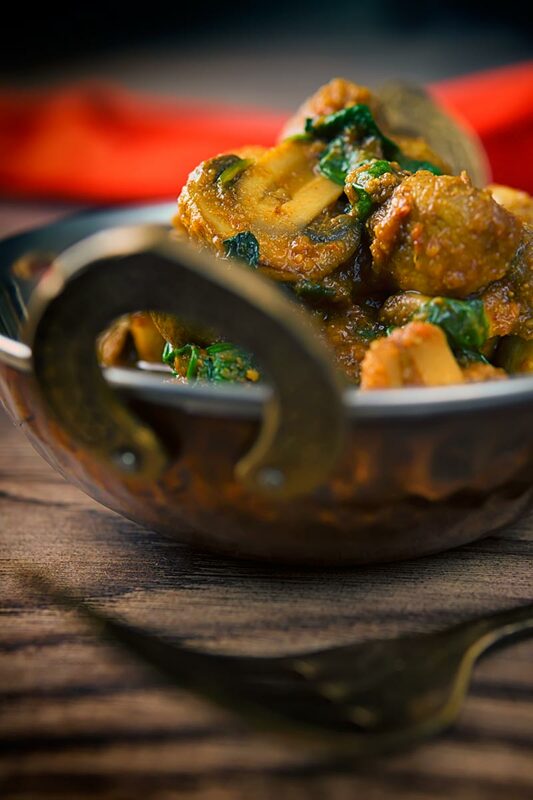 Cooking in less than 30 minutes means that it is a perfect mid-week curry! Add them to a blender with the garlic and ginger and blitz to a fine paste. Heat a dry pan over a medium high heat and then toast the coriander, fenugreek, and cumin seeds with the dried red chili for 1-2 minutes until fragrant. Grind to a fine paste with a spice grinder or pestle and mortar. Cut the mushrooms into bite sized pieces, I like to buy mushrooms where this involves cutting them in half. Heat a pan over a high heat and then add 1 tbsp of the oil. Throw in the mushrooms, season with salt and cook for 5 minutes to get a nice colour. Remove the mushrooms and return the pan to a medium high heat. Add the remaining oil to the pan and when hot add the spice mix along with the chili powder ground turmeric and stir for 30 seconds taking care not to burn. Add in the blended onion mix, mushrooms, water and tamarind pulp and stir, taste and as seasoning if reuqired. Cook on a low heat for 15 minutes before serving. For the last 2 minutes add in the spinach and add a lid, stir before serving. Serve with simply cooked basmati rice. What amazing flavors! Saving this for our meatless Friday menu! I don’t cook curry too often but when I do I always look for a new recipe to try. And I know exactly what you mean – sometimes it gets really daunting to find a new curry recipe that is both healthy and delicious. Well, at least I won’t have to do it again when I decide to make curry next time because I have your recipe now, and it is saved. 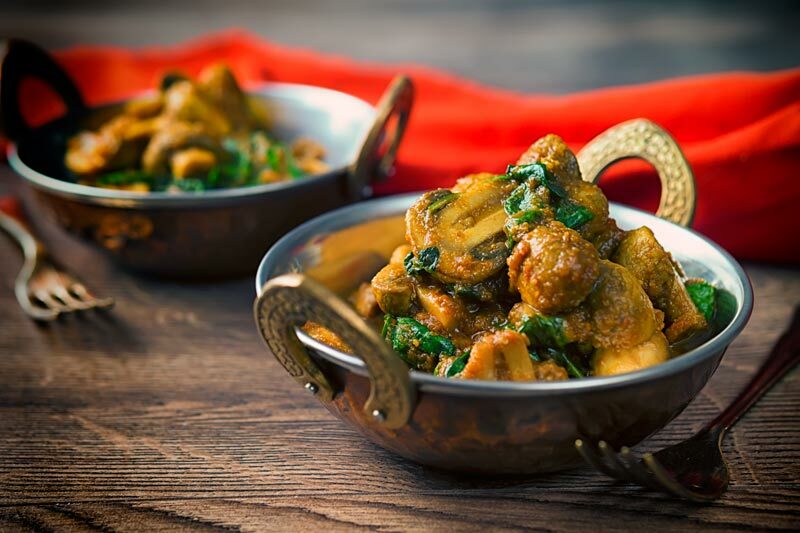 Delicious spinach and mushroom curry! You had me at curry! What a great recipe- I love spinach and mushroom together so I’m sure this would be delish. 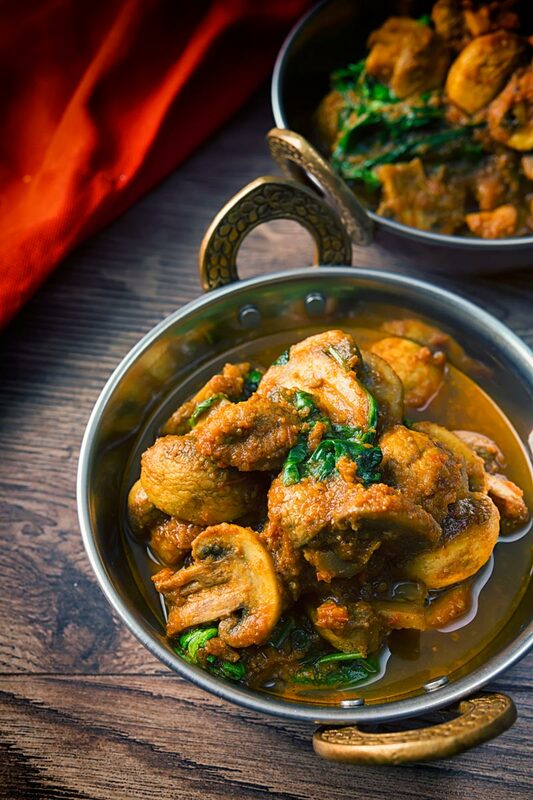 I agree – Indian cuisine is one of my faves and this curry looks so fantastic!